GRL Germany agents are always on the lookout for good new walls, especially ones with the right characteristics for urban projection. 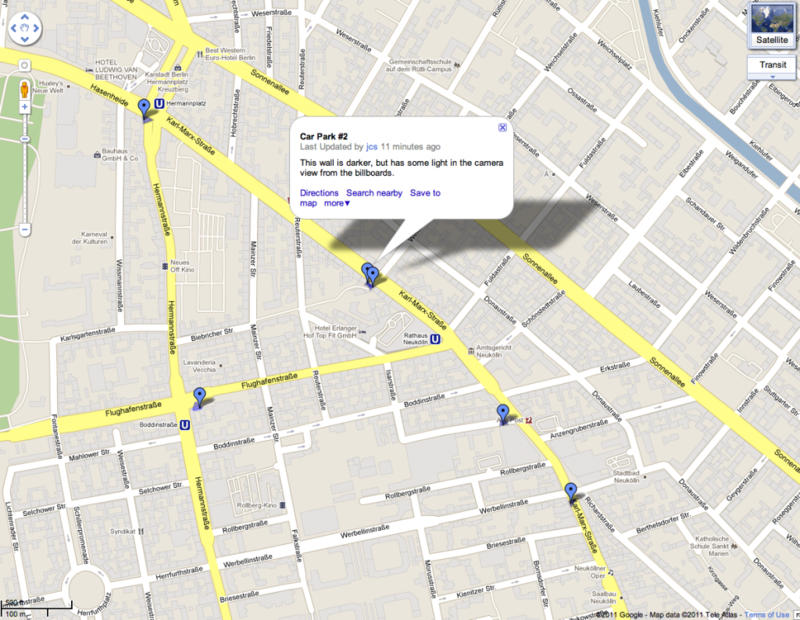 We have started a Google Map database, and invite you to contribute. To qualify, the wall should: * Be large and unobstructed by trees, lamp posts, billboards, etc. * Light coloured (light-medium gray or brown is borderline acceptable, depending upon the equipment) * Mono-coloured (ie. all one colour) * Non-reflective (ie. no corrugated metal surfaces) Ideal conditions: * Ideally of a horizontal (4:3-ish) aspect * Have publicly accessible power * Have clear lines of sight for passerby Collaborative Google Map is >> HERE << When editing/placing potential locations, please name them, give a brief description as to the situation (light, public, power, etc), and draw a shape indicating where the projection field would be vis-a-vis the projection surface.